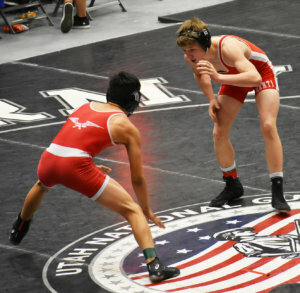 RICHFIELD—Area wrestlers faced off at the Utah 3A Divisional Tournament held at the Sevier Center last Friday and Saturday. Manti High School and North Sanpete High School both competed at the tournament. Manti wrestlers found success in the tournament. Damon Mayfield took first place in the 160 weight class. Seni Latu earned second place; Kayden Clark took fifth place; Dane Seely finished in sixth place; Kent Larson took seventh place; and Saili Moe came in eighth place. Overall, the Templars were ranked seventh in their division. The Hawks had two first place finishes. Luis Rodriquez placed first in the 170 class, along with Dalton Anderson who finished first in the 220 weight class. Laramie Roberts took fourth place in the 182 weight group. North Sanpete will also be competing in the state tournament at UVU next weekend. Manti will have half of their team competing and Manti Coach Ryan Fowles spoke confidently of six of his wrestlers who could potentially do well in the tournament.